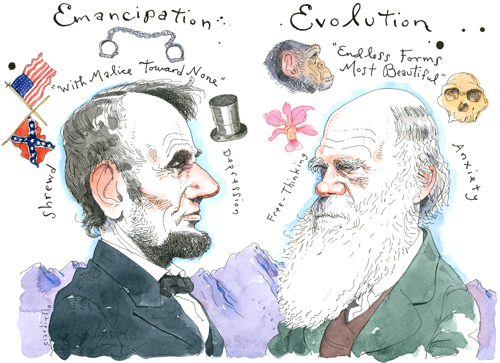 This week marks the 200th birthday of both Abe Lincoln and Charles Darwin. Both born on Feb. 12, 1809. Ah, enlightenment. Love how you arranged this image and how it's a comparison to reflect on. I didn't know of the twin birthdays. Thankfully, in contrast to Darwin's theory, more than 40% of Americans seem to believe in the emancipation! Cathleen, that was funny. Joe, awesome drawing, as always. Wow, that's a bit of cosmic wonder. What else happened on that day? It's probably about equal, those who believe in creationism and those who don't believe all races are created equal. I know in some districts of the southeast they DO NOT celebrate Lincoln's birthday and doubt they cut a rug for Darwin either. Darwin who? Happy birthday boys.. Joe- Beautiful line as always. Good to briefly say hi on Friday. What a cosmic birth date! The planets must have been in line that day, I'll tell ya. 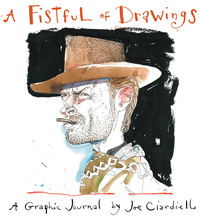 Great portraits, Joe. Excellent! Both great in profile. Cosmic birth date indeed: My daughter Ellen turns 12 on this day. Now the party can start! But Joe, I'm surprised that you weren't asked to include her. Maybe next year? Rob, an oversight, my apologies to your daughter. What a quirk of the calendar. Another beauty. I like all the floating things and combined with your banner header, makes your work seem very special and delicate. Very 2009!